ATLANTA, Georgia, June 21, 2011 (ENS) – American technology for the capture, transport and storage of the greenhouse gas carbon dioxide, CO2, is beginning to emerge. A 25-megawatt carbon capture and storage facility in Alabama began capturing carbon dioxide last week, the Southern Company utility announced June 13. Located at Plant Barry near Mobile, Alabama, the carbon capture and storage facility is the world’s largest for a coal-fired generating power plant. It will capture about 150,000 tons of CO2 annually for permanent underground storage in a deep saline geologic formation – the equivalent of emissions from 25 megawatts of electricity generation. “This is a significant milestone in our continuing efforts to research, develop and implement 21st century coal technologies,” said Southern Company Chairman, President and CEO Thomas Fanning, announcing the start of CO2 capture. In addition, Southern Company is managing the U.S. Department of Energy’s National Carbon Capture Center in Alabama, testing the next generation of technologies to capture carbon dioxide emissions. The center works with technology developers around the world to test and evaluate pre- and post-combustion carbon capture technologies. Using realistic conditions, their work is helping to make CO2 capture technologies more affordable as quickly as possible. Denbury Resources is working with a number of companies to transport carbon dioxide once it is captured. Denbury is currently constructing a 24″ pipeline from Donaldsonville, Louisiana to Hastings Field, south of Houston, Texas. Called the Green Pipeline, the 320-mile pipeline, estimated to cost a total of $825 million, will be one of the first pipelines designed to transport man-made CO2 in the Gulf Coast area. The most abundant greenhouse gas, CO2 is emitted by burning coal and other fossil fuels to generate electricity. Once in the atmosphere, the gas blankets the planet, trapping the Sun’s rays and causing the climate to change. Capturing and storing carbon dioxide deep underground is one way to remove the troublesome gas from the atmosphere. In addition to permanent storage, CO2 can be injected into existing oil wells to recover oil that would not otherwise be produced. Carbon dioxide at the Barry facility is being captured using Mitsubishi Heavy Industries Ltd. technology KM-CDR, which uses an advanced amine solvent. The process begins with coal combustion which generates electricity, leaving a flue gas. The CO2 from the flue gas reacts with the amine solvent before being captured from the flue gas. It is then compressed, making it ready for pipeline transport. Captured CO2 from the Barry plant will be supplied to the Southeast Regional Carbon Sequestration Partnership, or SECARB, for transport by pipeline and injection 9,500 feet underground at a site within the Citronelle Oil Field about 11 miles from the Barry plant. The injection site is operated by Denbury Resources. The CO2 will remain below the surface, permanently trapped in the geological formation and is not being used for enhanced oil recovery. A characterization well previously drilled within the field by SECARB revealed excellent characteristics for safe geologic storage. “Capturing carbon emissions and storing them underground is a crucial technology as we build a clean energy future and address the threat of climate change,” said Energy Secretary Steven Chu a year ago this month as he announced three projects selected to receive up to $612 million from the American Recovery and Reinvestment Act matched by $368 million in private funding. Selected by competition, the projects in Texas, Illinois, and Louisiana will demonstrate large-scale carbon capture and storage from industrial sources. Archer Daniels Midland Corporation of Decatur, Illinois will capture and sequester one million tons of CO2 per year from an existing ethanol plant in Illinois, starting in August 2012. This CO2 will be sequestered in the Mt. Simon Sandstone, a saline reservoir located about one mile from the plant. Leucadia Energy of Lake Charles, Louisiana, and Denbury Onshore will capture and sequester 4.5 million tons of CO2 per year from a new methanol plant in Lake Charles. 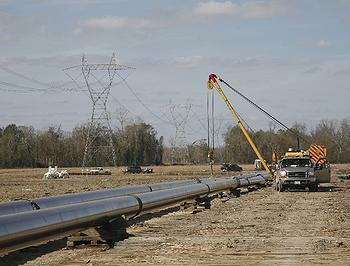 The CO2 will be delivered through a 12-mile connector pipeline to a Denbury interstate CO2 pipeline and used for enhanced oil recovery in the West Hastings oilfield, starting in April 2014. Air Products and Chemicals of Port Arthur, Texas will partner with Denbury Onshore to capture and sequester one million tons of CO2 per year from existing steam-methane reformers in Port Arthur, starting in November 2012. This CO2 also will be delivered via a connector pipeline to the Denbury interstate CO2 pipeline and sequestered by use for enhanced oil recovery in the West Hastings oilfield.